Samsung Galaxy S8 is definitely going to be the hottest phone in the market when it is released a few weeks from now. We know that the phone will be announced at the end of this month and even though we also know that availability begins in April, the exact dates are still unclear. Still, we have had our hands on quite a lot about both Samsung Galaxy S8 and S8+, but a lot of these are based on rumors and speculations. Over the past few weeks, we have been getting more tangible proof of the existence of the Galaxy S8 and S8+. In February, benchmarking website Geekbench came in with benchmarks of what is believed to be a processor meant for the S8 – a Qualcomm Snapdragon 835. The processor revealed some really impressive performance scores and just yesterday, details of the Exynos 8890, which will power some variants of the phones, also appeared on Geekbench. 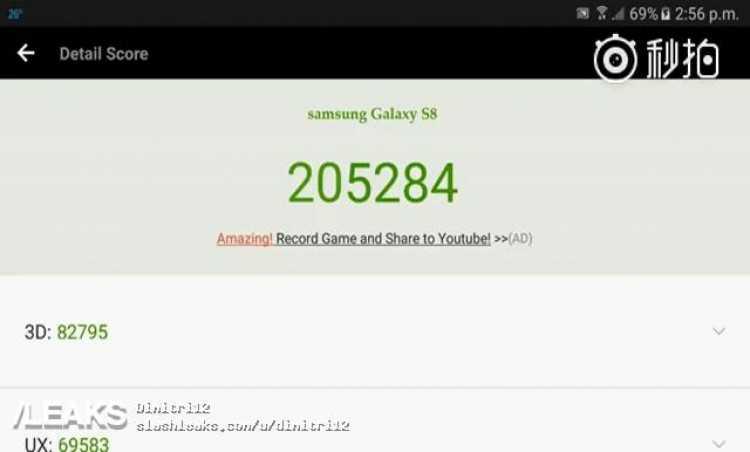 In a new video that has just surfaced, more details of Samsung Galaxy S8 have just been revealed yet again by another benchmarking platform – AnTuTu. The Galaxy S8 in the video has model number SM-G950 and carries the Qualcomm Snapdragon 835 SoC on board. The phone has been taken through all types of processor and graphics-intensive tests – same tests that the likes of Apple iPhone 7 Plus and OnePlus 3T have also passed – and the results are impressive to say. According to AnTuTu, Samsung Galaxy S8 managed a score of 205284, well ahead of the industry leader, Apple’s iPhone 7 Plus. The top score on AnTuTu’s smartphone benchmarks has been held for a long time by the Apple flagship, with the Android family being led by the magnificent OnePlus 3T. However, we have a new king in the shape of Samsung Galaxy S8. Apparently, the iPhone 7 Plus has a score of 181807 while the OnePlus 3T manages a score of 162423. Since OnePlus 3T uses a Snapdragon 821 SoC, these tests show that the Snapdragon 835 is indeed a massive improvement over not just its predecessor, but also Apple’s A10 Fusion processor that powers the iPhone 7 and 7 Plus.